"How two best friends from Queens became teen rock sensations, lost it all, and grew up to become voices of their generation.-from the publisher"
When you make a friend in the sixth grade, you don't expect that the two of you will change the world of music twenty years later. 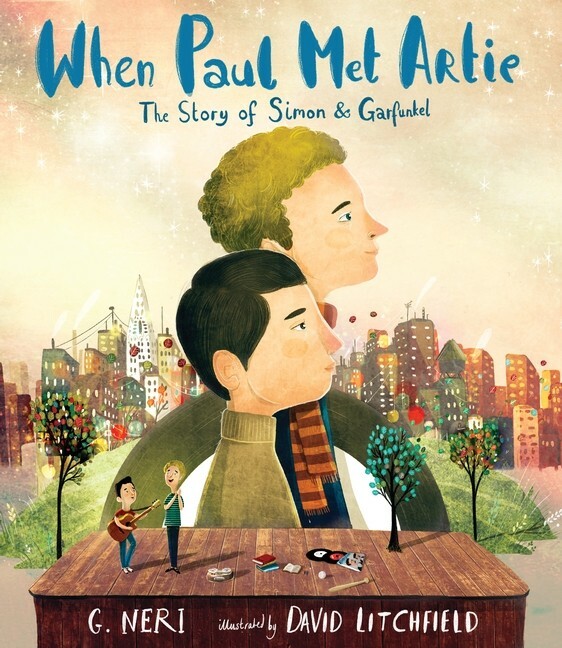 But that is the story of Art Garfunkel and Paul Simon. Artie saw a nervous Paul Simon get up and sing at the school talent show. Paul stopped the show with his incredible voice. Artie was inspired to want to do the same. 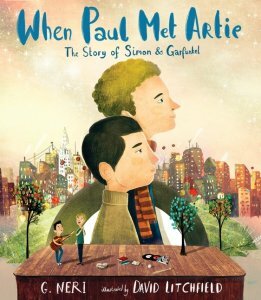 This is a full-fledged biography with a generous amount of text on each page that takes you on the roller coaster ride that was the early friendship and career of a couple of Jewish boys. Turns out when they finally produced their breakout song, the success and the money were pretty short-lived. As you think of these iconic names, you don't expect to read that they left music behind more than once believing they couldn't make a career out of it. This pair of musical giants had one flop song after another. If you read their story, you might wonder why they ever kept coming back to try again. But think of what they did once they found their sound and hit their stride. Two wild and crazy guys who loved to make jokes and do silly things wrote songs like He's My Brother and Bridge Over Troubled Water. They have commanded audiences of over half a million people in New York and Rome, Italy. This biography shines brilliantly as it brings us up close and personal with a pair of guys who could live on your street. There's a great scene where the two of them sit in a car in New York City listening to the Top 40 and hear their song announced as the number one hit of the week. Just a couple of guys hanging out and listening to their song. No paparazzi and no autograph seekers. Just the two of them. Historical context bleeds through and readers will get an understanding and an appreciation for the upheaval of the times these two geniuses were writing their songs and giving voice to the pain and anguish of so many people. A gorgeous book.